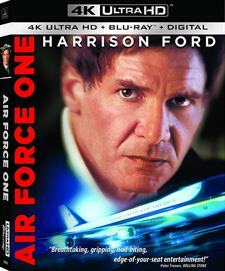 Download Air Force One in Digital HD from the iTunes store. 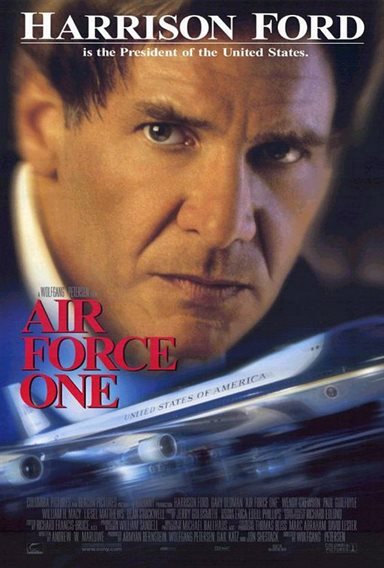 Air Force One images are © Columbia Pictures. All Rights Reserved. Terrorism is a worldwide threat and as the saying goes… "we don't negotiate with terrorists". But what if they somehow found a way to infiltrate the most secure aircraft in the world...Air Force One? What if they took the President of the United States and his family hostage? What if they were holding all the cards but meeting their demands would alter the fate of Europe? In 1997 we got a glimpse of what that might look like when the action, drama thriller Air Force One opened in theaters. Starring Harrison Ford (Raiders of the Lost Ark) the movie offered two hours of pulse-pounding tension of what could happen if something when terribly, terribly wrong. The film opens with the capture of Kazakhstan rogue general Ivan Radek (Jurgen Prochnow; Dune) being captured by combined American and Russian forces. Fast forward three weeks later to the President of the United States' speech where he vows that we won't negotiate. That same night he, his family and members of his cabinet board Air Force One to return to the United States. However part way through the flight, the plane is hijacked but not before the escape pod ejects allowing for the President's escape or so it seems. It seems the plane has been taken over by Radek loyalist Ivan Korshunov (Gary Oldman; Darkest Hour) who is demanding his release. He vows to shoot a hostage every half hour until the general is let go but unbeknownst to him President Marshall is still on board the plane and attempts to orchestrate a rescue plan. Unfortunately, things don't go according to plan and he finds himself a hostage too. Korshunov then demands he negotiate the release of Radek but tides change and once most of the hostages are off the plane, the President rescinds that release thwarting the terrorists' plan. Writer Andrew W. Marlowe (End of Days) and Director Wolfgang Petersen (The NeverEnding Story) offer a heart-pounding, nail-biting film that keeps the audience engaged the entire time. The script is well done with minimal clichés and just a moment or two of humor. Ford is at his best here as the hero and has a commanding presence as the Commander in Chief. Oldman always plays the villain well and this is no exception. You hate him from the beginning and continue to do so until his defeat. Glenn Close (Fatal Attraction) as Vice President Kathryn Bennett is strong as well, rounding out a talented cast. The 4K transfer of this movie is adequate at best. Some scenes have a sharp resolution while others are grainy and lack clarity. The 2160p video is hit or miss here which can be distracting on occasion. Fortunately, the Dolby Atmos audio doesn't suffer the same fate and the sound quality is excellent. The viewer can really feel themselves running around the plane hiding from hijackers with this release. The combo pack offers a 4K disc, Blu-ray disc, digital download, and only two extras which are the audio commentary with Peterson and the theatrical trailer. It is scary to think that something like this could actually ever happen and makes you wonder just how vulnerable the world's leaders can be. Luckily this is only a film and a damn good one at that. It offers a great cast, strong action sequences and a solid plot that will keep one entertained throughout. In the action/hostage/drama genre it is a top pick along with Die Hard so if you are a fan, you will definitely want to pick this one up during your holiday shopping this year.